In the blog post, we have included information for travel tech startups and entrepreneurs. After reading this blog, you will be familiar with the strategies of Booking.com and a few main features to consider while you develop your own travel booking app like Booking.com. Thinking twice to arrange a small trip has long become a thing of the past. These days, we have the mobiles with travel booking apps making the task easier for us, thanks to technology. Booking a trip, may it be just for a short 2-day travel or a long 1-month stay, booking the flights and hotels has been brought to your fingertips. 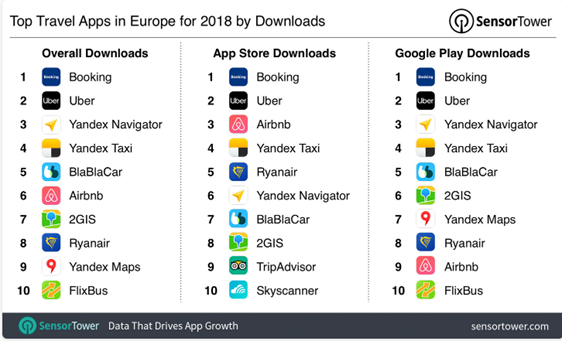 Here is a chart from Sensortowers which shows the top 10 travel apps in Europe being downloaded from App store, Google play and overall. We can see the Booking ranking first. The below graph shows the Google Play rank for Booking.com in Travel and Local category is 4th, its usage rank can be seen 11th. 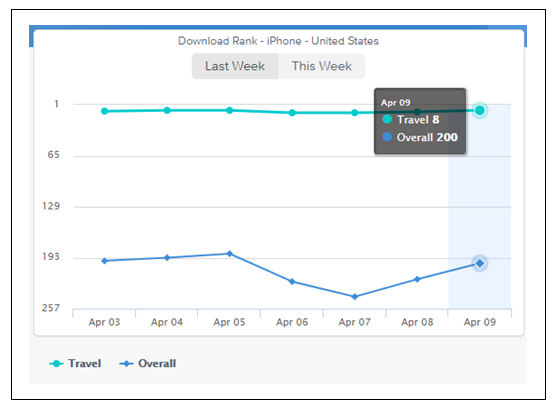 Here is a graph for App Annie that shows the ranking of Booking.com app in the last week in the category of travel and overall. Booking.com is a travel fare aggregator website and travel booking app. It is also a travel meta-search engine for lodging reservations. Booking.com has its headquarters in Amsterdam. The website and app have over 28,425,726 listings in around 148,470 destinations in about 228 countries and territories. The travel booking app was founded in 1996 by Geert-Jan Bruinsma. However, it was later merged with Booking Online which was founded by Sicco and Alec Behrens, Marijn Muyser and Bas Lemmens which operated as Bookings.org. Later the name was changed back to Booking.com. The company was brought by the Priceline group (Booking Holdings) in 2005. Booking.com is available in more than 40 languages and guarantees the best prices for any type of properties. Booking.com also allows users to book flights, cars, and airport taxis. In a report from Statista, the revenue of Booking Holdings worldwide was around $12.68 US dollars. 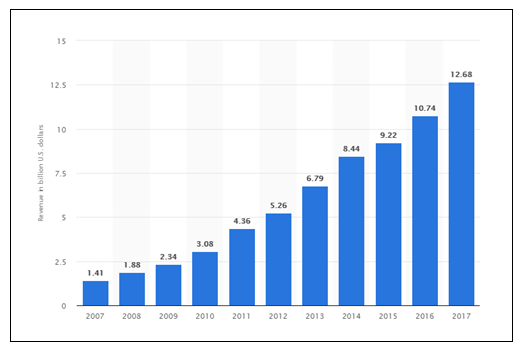 Here is a graph that shows the revenue of Booking Holdings from 2007-2017. Creating a travel booking app requires the “search” feature is one of the core features to consider. This feature is the heart of the application. If the user is looking for a hotel, motel or a holiday home, the feature must be easily visible and simple to handle. The user-friendliness of this feature will let the customers choose you over other travel booking apps. While searching for the best available options, the users should be presented with the expected choices as per their requirements. 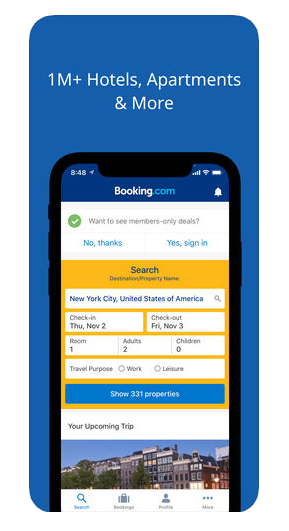 While planning to build an app like Booking.com, make sure your search feature works as smoothly as possible and provides results within a few seconds. The filters allow users to perform a seamless transaction on the travel booking app. While searching for things related to their travel, the users must be enabled to apply certain filters while searching for budget, number of persons, hotels or motels on the basis of reviews and services available. When they apply these filters, the search that fits in the applied filters should be displayed. These filters save the users trouble of going through the entire listing to find a suitable place to stay. The travel booking app should search for the options fit for the user after applying the filters by running certain algorithms on the search feature and display the best possible listings for the users. The user can apply filters like the price of the room, the number of people staying, check-in and check-out dates, type of hotel room, etc. A user is enabled to manage their bookings on the app in a hassle-free way. They can make changes in the bookings whenever they want to. They can get paperless confirmations regarding their bookings. The users get to contact their host and view their check-in times. The Booking.com site and app allows the travelers to write reviews and rate services for the hosts. The app allows easy in-app payments with credit cards or online wallets. They do not charge a booking or credit card fees. 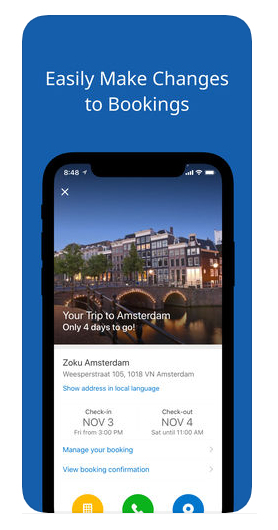 Localization of your travel booking app is important because having an app in their own language engages the users better than having an app in some other language. The users are able to connect better with the app supporting their own language. Global currency support is essential to manage payments worldwide. While developing a travel booking app, you must consider this feature if you wish to introduce the app worldwide. Lastly, about the deals, they are to keep users engaged and attracted to your travel booking app and increase your customers through word of mouth. The best strategy that Booking.com followed for its success was being the first one in the competition. However, there are many other travel booking apps who have joined the competition and made it huge. One of them is Klook. Why choose Coruscate to Build Travel Booking app like Booking.com? We can help you build an amazing travel booking app and help you make it land amongst the best travel booking apps across the world. The travel industry is growing far and wide and the travel booking apps with some out of the box features are always in demand. We can develop such an extraordinary app for your business based on your unique requirements. Our research team can help you while choosing some really amazing features for your app once you connect with us for a free consultation. We are trusted by all our clients and have a record of 100% success in all our projects. We have entertained over 2000 queries from the travel sector and many a few successful applications for our happy clients. Connect with us through below button for a free demo or price estimation. How travel booking app helps your travel Business to Grow?